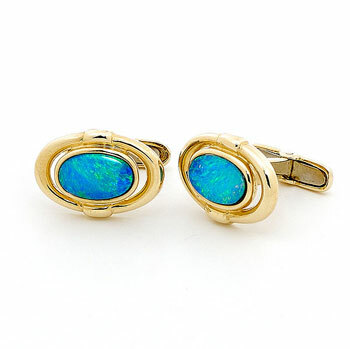 This 14k Yellow Gold Light Opal Doublet Cuff Links are designed for men who appreciate simplicity and style in their jewellery accessory. The pair of matching Australian doublet opals measure 10mm x 6mm in dimension and are sourced directly from quality opal mines in Coober Pedy, South Australia. Our jeweller then craft them into a classy 14K yellow gold bezel setting. A brilliant gift idea that is not to be missed!